How Is a Curved Stair Lift Designed? Not all stairways go straight up and down between floors in a home. If a staircase takes a turn, or multiple turns, before reaching the next floor, a curved stair lift is used. 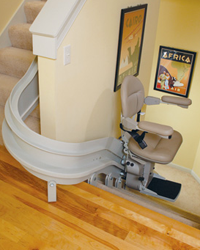 Curved stair lifts are designed with custom rails that are specific to each stairway. No compromises need to be made when installing a curved stair lift instead of a straight one. A curved stair lift will be able to take every turn and can still be mounted to either side of a staircase. When designing a curved stair lift, specific measurements must be taken from the stairway that needs increased mobility. After the measurements are taken, a custom rail is fabricated to fit that staircase. Then the rail can be installed in the home and will operate just like a straight stair lift. A curved stair lift will provide all the same benefits as a straight stair lift. 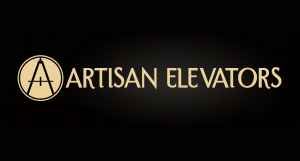 They provide the ability to increase mobility on any staircase with their custom design. They also still use the same direct drive motor that has a rechargeable battery, allowing for use even during a power outage. Curved stair lifts have arms, footrests, and a seat that folds up for convenience. The seat also swivels at the upper landing for easy on and off access. If anything, there are more benefits to a curved stair lift than a straight one because they can be customized to fit any staircase. By installing a curved stair lift, you do not have to give up any of the conveniences and benefits of a stair lift. Any staircase can be fitted with a stairlift because the track is customized to fit the exact specifications it. Anyone can benefit from having a curved stair lift installed in their home.